Call for a quote on your waste disposal needs! 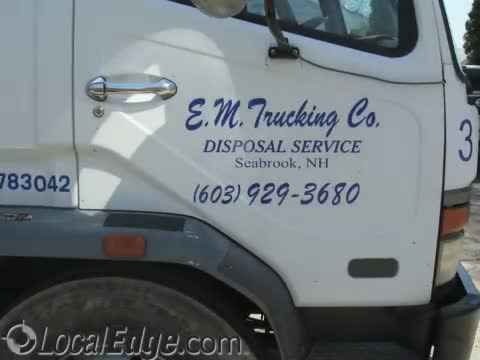 EM Trucking provides garbage removal and waste disposal services to residents in Seabrook, NH and the surrounding areas. Established in 1999, we have since expanded into the seacoast area as well as all of New Hampshire, Maine and Massachusetts. Give us a call at 603-929-3680 for reliable trash removal service at the most affordable rates! Here at EM Trucking Company LLC, our business is garbage removal, transportation, and waste disposal. We're a local company proud to serve the Seabrook, NH area with a variety of trash removal products and services. We're here to make your life easier by providing and transporting disposal containers of various sizes to and from your project site. We offer roll-off disposal service, trash removal, as well as industrial, commercial, construction and residential waste disposal. We are the fastest and most reliable means of garbage removal. We offer dumpster rentals, open top containers, and other services. We are the best garbage removal company in the area. We can assist residential and commercial clients with their needs. In addition to rentals, some of our other services include demolition removal, construction site debris removal, and more. We always arrive on time and efficiently complete your job. We serve customers in Seabrook, NH and the surrounding areas. If you need garbage removal services, get in touch with us today. With its modern, well-maintained trucks, EM Trucking Co has a long history of removing all types of debris. Our roll-off disposal service and 15, 20 and 30 yard open top containers, we are equipped to handle all your disposal needs. We can remove construction debris, furniture, concrete, stone or brick in our containers for a flat fee. On the other hand, we unfortunately cannot accept hazardous materials, televisions, monitors, or appliances. We specialize in waste disposal and trash removal! At E M Trucking Co Disposal Service we believe that together we can make a difference for future generations by focusing on responsible environmental practices today. It is our goal to provide quality and cost-effective garbage removal to both our residential and commercial customers in Seabrook, NH. Whether you operate a family business with a few employees or an industry with a large workforce, let us help you arrange the most convenient and practical garbage removal services to meet your needs. We can help you keep your property clean, green and hygienic with our trash removal services. We offer affordable services for both homes and businesses. If you reside in Seabrook, NH or the surrounding areas, you can always count on us. We will arrive on time and ensure that all of your trash gets removed. If you have more questions about our residential and commercial trash removal services, get in touch with one of our friendly representatives today. Ordering one of our waste disposal products is easy. You can order one of our containers just one to two days in advance over the phone. We ask that any first-time customers pre-pay for their container at the standard rate. You can either give the driver a check at the time of delivery or you can easily pre-pay over the phone with your credit card. Checks can be made payable to EM Trucking Co. It couldn't be easier to handle waste disposal with us! Just give us a call a few days in advance and we'll have your container ready for you, simple as that. We do ask that first-time customers pre-pay for their container, either over the phone with a debit card or with a check to the delivery driver. Checks can be made payable to EM Trucking Co. But after that, our waste disposal services are all yours! Give us a call at (603) 929-3680 for reliable service at the most affordable rates in the garbage removal industry. Our flat fees can help you meet your waste disposal needs without breaking the bank. We are here to take care of all of your trash removal needs in Seabrook, NH. We offer responsible & reliable roll-off disposal service in Maine, New Hampshire, and Massachusetts. Call us today if you need dumpsters or open top containers to dispose of your construction site or remodeling debris.